Do Ivy Plants Like Full Sun? 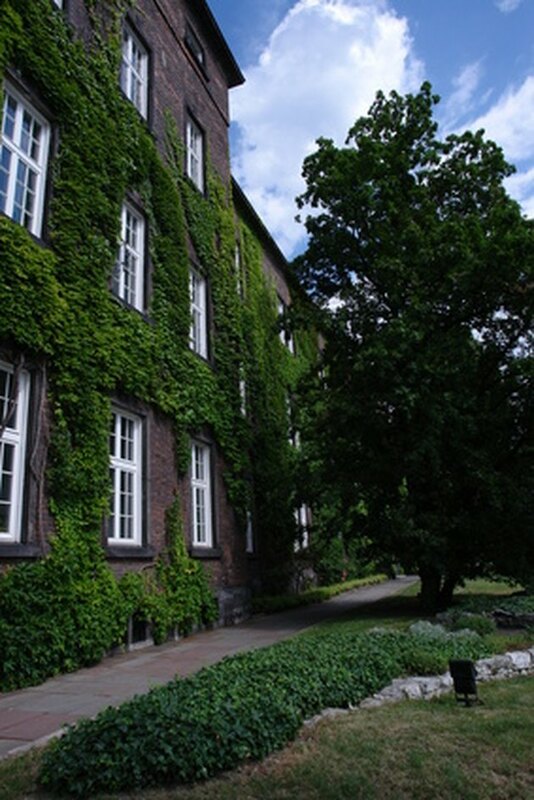 Ivy describes a variety of creeping and climbing vine used as a landscape ground cover or to cover buildings to give them a genteel, aged appearance. There's no single answer to whether ivy plants like full sun. Different ivy species have different sun tolerances. Sun-loving varieties thrive in full sun to partial shade. Shade-loving types thrive in dappled to deep shade. Many ivy types stay green all year long if protected from winter sun and wind. Popular sun-loving ivy varieties include Boston Ivy (Parthenocissus tricuspidata), a deciduous winter-hardy ivy. Its triple leaves turn bright burgundy in the fall before being shed for winter. Persian ivy (Hedera colchica) is an evergreen ivy with large, thick leaves, suited for southern states. Japanese ivy (Hedera rhombea) has evergreen leaves with a narrow cream margin, and is suited to southern states. Popular shade-loving ivy includes English ivy (Hedera helix) an evergreen ivy with tri-lobed leaves that's moderately winter hardy. Algerian ivy (Hedera canariensis) is an evergreen ivy with large green and bronze leaves, suited for southern states. Ivy prefers moist but well-drained soil rich in organic matter, such as is found on the forest floor. Ivy plants don't like standing water. As a landscape plant, ivy does well on steep or shaded banks and areas under trees that are too shady for grass. It also does well as an underplanting between shrubs. As a horizontal creeping vine, most varieties grow to about 6 to 8 inches high. All ivy varieties are excellent climbers, reaching heights of 50 feet on walls, fences or trellises. Ivy grows vertically by extending rootlets with adhesive tips that cling tightly to brick, masonry or wood. You can propagate most ivy varieties by cutting off several inches of a growing vine tip and putting it in water. Roots will emerge in about a month, and the cutting is ready to plant. Plant the cutting in the ground deep enough to cover all the roots and put a couple of inches of moist soil on top. You also can spread ivy by putting a growing vine tip several inches in the ground and covering with soil. The tip will sprout roots and grow into a new vine. Space plants about a foot or two apart for fast coverage. There are ivy varieties that are winter hardy in most of the U.S. snowbelt states. In areas with mild winters, any ivy can become an invasive weed if not kept in check. The edges of your ivy patches need to be trimmed back two or three times a year. If the ground cover has gotten thicker than you want, use a hedge trimmer to cut it back down. This is best done in spring so new growth will quickly cover bald spots. Keeping ivy trimmed also will deter problems from slugs, snails, rodents and fungal diseases. If ivy has invaded, cut the main stems at the root and apply a weed killer to the cut surfaces of the root to prevent new shoots. Then pull up the unwanted top growth and dispose of it in the trash or by burning. What Is an Easy Way to Kill Outdoor Ivy?